The Things They Carried completely destroyed me. I am an easily affected person, but I don’t cry easily. In fact, I don’t think a book has ever made me cry before, but I can feel the tears coming just thinking about this book. After (mostly) completing the Pulitzer challenge, I’ve read dozens of books about various wars, and it seems that those actually written by combat veterans are rarely linear. That’s certainly true of this book, which is sort of a collection of stories and sort of, well, something else. I could feel Mr. O’Brien trying to make sense of everything while at the same time trying to explain feelings that are impossible for civilians to comprehend. So much of the subject matter made me uncomfortable, but the author was completely fearless when describing scenes that most veterans would never want to think about, let alone admit to the world at large. Through flawless prose and a rawness that completely wore me down, Mr. O’Brien did an exceptional job of giving the reader the largest glimmer possible into the mindset and emotions of a person in combat. 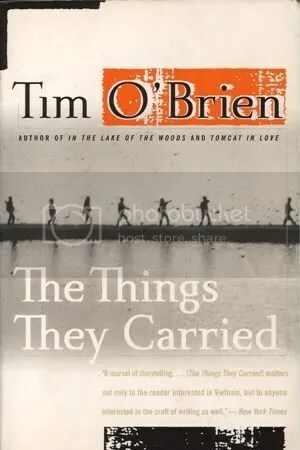 Easily one of the best and most important books I’ve ever read, The Things They Carried will stay with me for a long time. This entry was posted in book reviews, books, favorites, fiction and tagged book review, books, favorites, fiction, o'brien. Bookmark the permalink.